When national emergencies or disasters such as floods and hurricanes occur, supplies and services need to be procured by the federal government and rushed to the affected area. To expedite this process, the System for Award Management (SAM) contains a Disaster Response Registry in accordance with FAR Subpart 4.11 and FAR Subpart 26.2 listing those contractors who are willing to provide debris removal, distribution of supplies, reconstruction, and other disaster or emergency relief supplies and/or services. 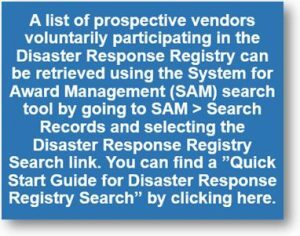 A company must be registered in the System for Award Management (SAM) at https://www.sam.gov for federal contracts and other procurement opportunities in accordance with FAR Subpart 4.11, to be included in the Disaster Response Registry. On average, it takes 2-3 days to properly register and have a company’s registration become active in SAM. It may take longer. During the registration process, companies must indicate that they want to participate in the Disaster Response Registry and provide the required information on the Disaster Response Information page within the “Assertions” module. Once a company’s registration is activated, it will be added to the Disaster Response Registry, and federal contracting officers will be able to locate the company through the search function within the Disaster Response Registry. You can get FREE help with your registration by contacting the supporting Federal Service Desk (FSD). 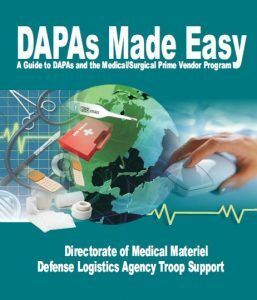 In addition, if you are located in the U.S. and its outlying areas, you can get FREE support from your local Procurement Technical Assistance Center (PTAC), an official resource for government contracting assistance. Check the PTAC website at http://www.aptac-us.org/find-a-ptac to locate your closest PTAC. 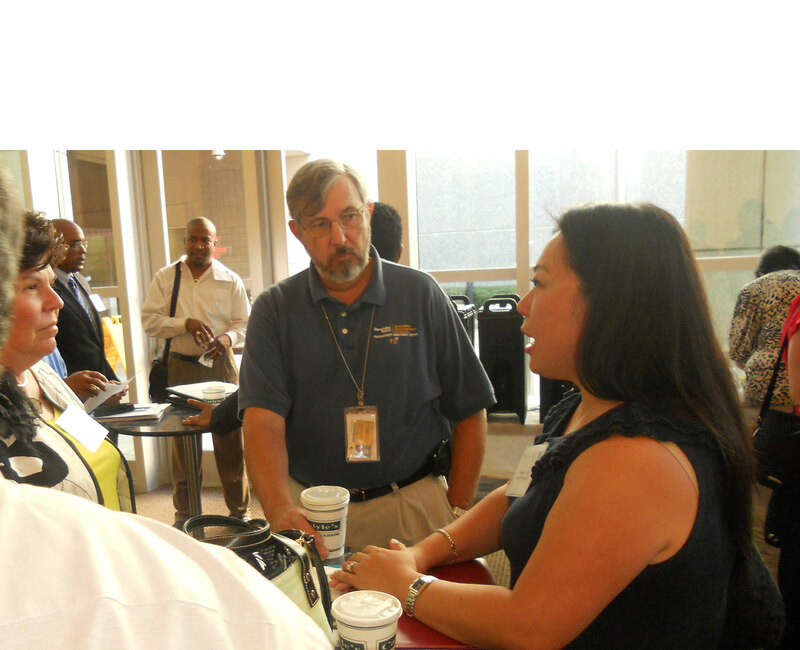 In Georgia, you can contact a PTAC counselor at the Georgia Tech Procurement Assistance Center at: http://gtpac.org/team-directory. In April of this year, the Georgia Tech Procurement Assistance Center (GTPAC) reported on the guilty plea entered by the operator of a phony government contract registration firm charged with wire fraud for his part in tricking at least 1,200 businesses into believing they needed to employ his services in order to qualify for contracts issued by the Federal Emergency Management Agency (FEMA), a unit of the U.S. Dept. of Homeland Security. On Friday, August 11, 2017, he was sentenced to four years and two months in federal prison, along with a $594,000 judgment against him, for his role in these fraudulent activities. In Tampa, Florida, U.S. District Judge Charlene E. Honeywell imposed the sentencing terms on Michael Pirolo who earlier pled guilty to the charges against him. According to court documents, Pirolo served as the president of Government Contract Registry, Inc. (GCR), doing business as FEMA Contract Registration. He employed telemarketers who, during communications with victim-companies, falsely claimed that — for a fee — GCR would “register” the companies with FEMA to enable them to receive preference in obtaining contracts from FEMA. The GCR telemarketers’ communications were based on instructions and scripts that they received from Pirolo. Specifically, the telemarketers falsely and fraudulently stated that for a one-time fee of $500, the customer would be registered with FEMA, and that this registration would place the customer on a list of “preferred” vendors. When the need for a vendor arose, GCR telemarketers falsely stated that FEMA would bypass the standard contract acquisition process, contact the registered victim-company, and then offer a no-bid contract. At times, Pirolo also instructed GCR telemarketers to go back to victim-companies that had already paid the $500 one-time fee and seek renewal and payment of another fraudulent $500 fee. To further the scheme, the GCR telemarketers provided victim-companies with an online GCR form that requested the same information as a form on FEMA’s public website. In fact, FEMA does not charge a fee to companies to complete its vendor information form. The purpose of FEMA’s form is to assist the agency with market research in identifying viable possible vendors. 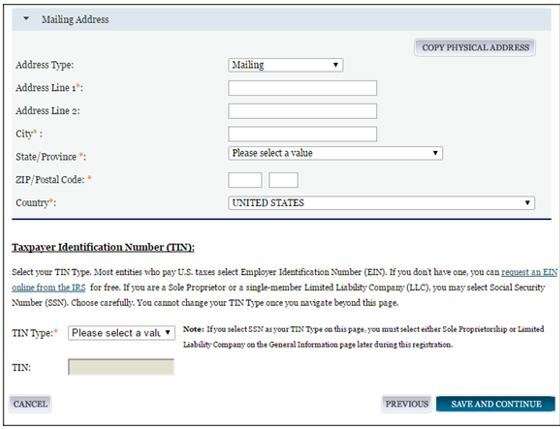 FEMA’s form does not “register” companies. 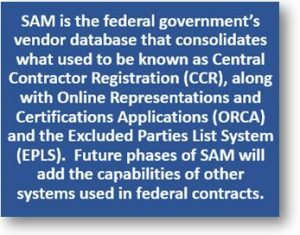 In actuality, registration in the federal government’s System for Award Management (SAM) is the government-wide vendor registration system. Vendors can register in SAM at no cost. 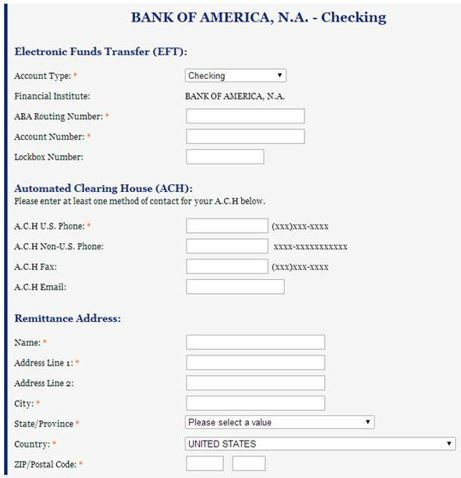 Once GCR telemarketers received the victim-companies’ information, GCR completed and submitted the online FEMA form that then enabled emails to be sent from FEMA to the victim-companies, giving the appearance that the companies had been “registered.” The FEMA emails gave GCR the appearance of legitimacy. 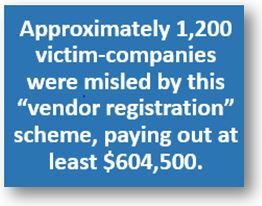 The approximate 1,200 victim-companies who were misled by this scheme paid GCR at least $604,500. This case was investigated by the U.S. Department of Homeland Security, Office of Inspector General, and the General Services Administration, Office of Inspector General. It was prosecuted by Assistant United States Attorney Adam M. Saltzman. 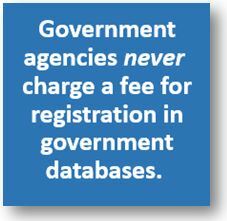 GTPAC again reminds its clients and all other vendors that government agencies never charge a fee for registration in government databases. This includes vendor databases maintained by FEMA and the government-wide vendor database known as SAM. For no-cost assistance with registering in SAM — and no-cost help with many other aspects of government contracting — contact GTPAC at http://gtpac.org/contact-us. 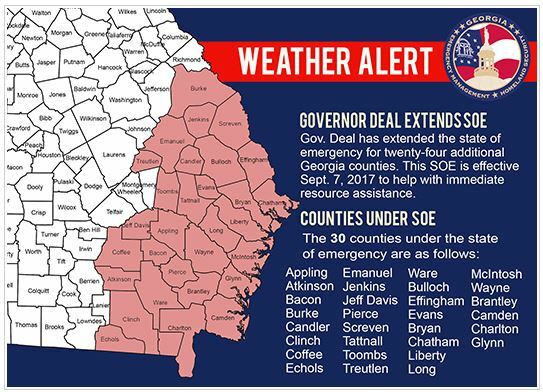 If your business is located outside the state of Georgia, feel free to contact the procurement technical assistance center (PTAC) nearest you. Locate the PTAC offices in your state at http://www.aptac-us.org/find-a-ptac. There is no shortage of news these days involving Russia. You would think that U.S. government contracting would be immune from these considerations. You’d be wrong. That’s because on July 11 2017, the Government removed Moscow-based Kaspersky Lab products from the General Services Administration’s Schedule Program. Kaspersky provided products through resellers which held GSA Schedule 67 and 70 contracts for photographic equipment and related services, and IT services. As a company based in Moscow, Kaspersky came under scrutiny from the Government and was removed from the schedules “to ensure the integrity and security of U.S. government systems and networks” according to a GSA statement cited by Reuters. According to the Government’s System for Award Management (SAM), Kaspersky remains an active contractor and has not been suspended or proposed for debarment. Accordingly, agencies can still purchase Kaspersky products but not from Kaspersky’s previously held schedule contracts.